Summarized from State Statues (Chapter 340) and the Wisconsin Department of Transportation. The bicycle is defined as a vehicle. The operator of a vehicle is granted the same rights and subject to the same duties of the driver of any other vehicle. Always ride on the right, in the same direction as other traffic. Ride as far to the right as practicable – safe and reasonable, not as far right as possible. When overtaking and passing another vehicle traveling in the same direction. When preparing for a left turn at an intersection or driveway. When reasonably necessary to avoid unsafe conditions, including fixed or moving objects, parked or moving vehicles, pedestrians, animals, surface hazards or substandard width lanes – a lane that is too narrow for a bicycle and a motor vehicle to travel safely side by side within the lane. Bicycles on a one-way street with two or more lanes of traffic may ride as near the left-hand or right-hand edge or curb of the roadway as practicable; and in the same direction as traffic. Bicycles may be ridden, but are not required, to ride on the shoulder of a highway unless prohibited by local ordinance. Riding two abreast is permitted on any street as long as other traffic is not impeded. When riding two abreast on a two or more lane roadway, both bicycles have to ride within a single lane. Bicyclists are required to use the same hand signals as motorists. Hand signals are required within 50 feet of your turn. It is not required continuously if you need both hands to control the bicycle. A motorist passing a bicyclist in the same lane is required to give the bicyclist at least 3 feet of clearance, and to maintain that clearance until safely past. 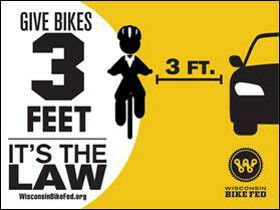 A bicyclist passing a stopped or moving vehicle is also required to give at least 3 feet of clearance when passing. State Statutes allow local units of government to permit vehicles on sidewalks through local ordinances, e.g., Grand Avenue in the City of Schofield. When bicycles are allowed to be operated on sidewalks, bicyclists must yield to pedestrians and give an audible warning when passing pedestrians traveling in the same direction. At intersections and other sidewalk crossings (alleys, driveways), a bicyclist on the sidewalk has the same rights and duties as pedestrians. Bicycling at night requires at least a white front headlight and a red rear reflector. The white front light must be visible to others at least 500 feet away. The red rear reflector must be visible to others between 50 and 500 feet away. A red steady or flashing rear light may be used in place of the required reflector. These are required no matter where you ride – street, path or sidewalk. The operator involved in an accident resulting in injury to or death of any person, or total property damage owned by any one person of $1,000 or more shall immediately give notice of such accident to the police. Injury means injury to a person of a physical nature resulting in death or the need for first aid or attention by medical personnel, whether or not first aid or medical treatment was actually received. This section does not apply to accidents involving only vehicles propelled by human power. State law allows a bicyclist facing a red signal at an intersection, after stopping as required, for not less than 45 seconds, to proceed cautiously through the intersection before the signal turns green if no other vehicles are present at the intersection. The bicyclist shall yield the right-of-way to any vehicular traffic when proceeding through the green signal at the intersection.